It took Jammu and Kashmir 53 years to bring home its rare artifacts from Himachal Pradesh. But the entire restoration process was departure from the usual official practice. It was a Public Interest Litigation (PIL) filed in J&K High Court seven years ago that maintained a long-desired status quo. Behind the return was the man who used PIL as a judicial tool to make systems work. Thirty two years have passed since Imdad Saqi filed his first PIL. Today as he sits inside his office in Srinagar’s Fleet Street, Saqi has so much to share. The man in his early fifties sporting blonde hair chronicles his career as a senior assistant in High Court where he learned to use law for the betterment of the society. However as guns rattled in Kashmir, he left that case unattended. But before the situation would hush him, Saqi had filed PILs against the movies like Girftaar, Coolie for hurting the sentiments of Muslims. It was because of his move that led to the deletion of certain dialogues from these movies besides banning actor Amitabh Bachan from shooting in Kashmir for at least three years. Pre-ninety period saw Saqi taking some important initiatives. He along with advocate Muzaffar Hussain Beigh, now member Parliament, filed a criminal case against a BJP member Praveen Tagodia. Behind the PIL was the bizarre claim made by Tagodia—“that the holy relic at Hazratbal Shrine actually belongs to some of his Hindu saint”. But Saqi’s PIL campaign hit the roadblock during nineties and for a while, he continued with his Urdu fortnightly Dabistan launched in 1982. After closing the fortnightly, he started a weekly Sadai Haq. 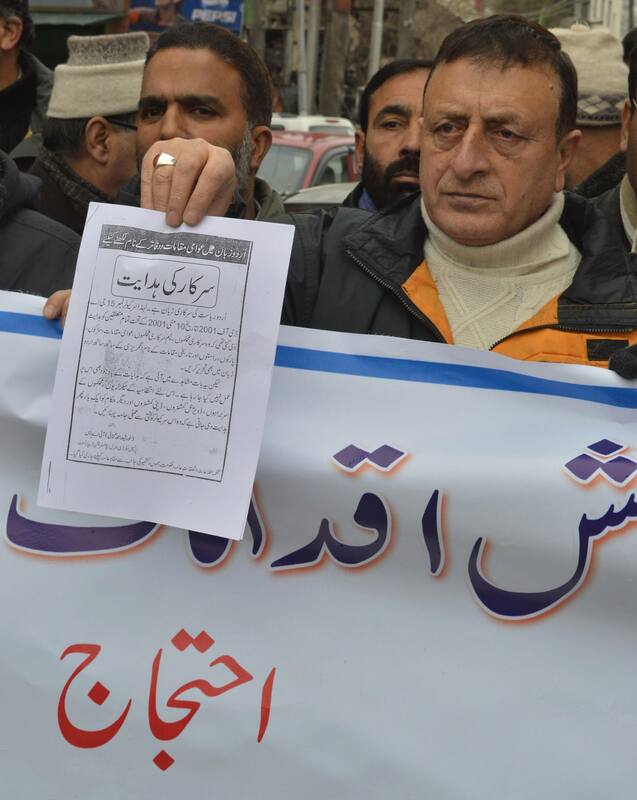 With Kashmir becoming newsmen’s paradise during that period, Saqi reported for various foreign wire agencies before hired fulltime by an Iranian agency and a Germany-based agency, DPA (Deutsche Presse-Agentur). In between, his brush with poetry secured him a berth in ‘All India Hindi Urdu Sangam’. During the same period, he visited 18 different countries. In all these countries, he observed a sense of belongings among people for their countries. “But in Kashmir, the same is missing, though we too claim the same but the reality is something different,” says Saki, who floated his own civil society group Valley Citizen Council by 2007. Due to paucity of funds, he grouped volunteers to clean the Dal Lake. Later Saqi took out 18 truckloads of garbage from the interiors of this Lake. But once the situation assumed a relative calm, Saqi was back with PIL. By 2008, he filed a PIL for the conservation and retrieval of artifacts stolen/transferred from Kashmir to other places. And now, in 2015, Himachal Pradesh became the first state to return artifacts and manuscript—otherwise ‘gifted’ by various bureaucratic circles to museums across India. Even the forces have been found involved in certain shady transfers. There is a case filed by SPS museum against CRPF personnel accusing him of ‘stealing’ some of the scriptures. The treasure restored by Saqi’s PIL was ‘gifted’ to HM in 1962. It included a collection of 31 copper and silver coins from Mughal and Sultanate period, one Persian manuscript Mughazi-ul-Nabi by Sheikh Yaqoob Sarfi (RA), one 19th century Sharda Manuscript Pancratna by Krishna Pandit, one Dogra-era Gun and an 18th century painting by Swachanda Bhairva. Calling it ‘cultural loot’, Saqi says his group fought to get back these artifacts. Not only outsiders, Saqi alleges, “even Kashmiri officers looted our treasure.” Some of the artifacts, he says, were taken to the University of Kashmir, only to be retained by it. Even SPS Museum’s latest survey highlights the same ‘cultural loot’. In painting gallery, 5 paintings of total 685 have been shifted to KU’s Central Asian Museum in 1980. In textiles gallery, of total 342 items, nine were shifted to KU in the same year. In natural history gallery, of total 623 items, three were shifted to Moti Lal Nehru Children Centre Lucknow in 1958. In manuscripts gallery, of total 2400 items, one manuscript of Holy Quran bearing the seal of Emperor Aurangzeb stands stolen since 2003. In decorative art gallery, of 1120 artifacts, 18 were shifted to KU and two to Lucknow. In archaeology gallery, says the survey, of total 2151 items, 136 were shifted to KU in 1980 and five were shown as stolen in 1975. In numismatics gallery, of total 71910 coins, some copper and silver coins were shifted to Shimla Museum (Himachal Pradesh), 25 copper coins to Lucknow, and 24 more copper coins stand missing. Apart from rallying behind the return of these historical manuscripts, Saqi has filed a series of PILs against illegal construction in and around Dal Lake, polythene, dog menace and now the Maggi controversy. It was because of his PIL, Kashmir was the first state to check, ban Maggi. With PIL emerging as an instrumental tool to make systems works, many are visiting J&K High Court now with it to get the things done. As on date, 15 PILs were listed in 2012, 23 in 2013, 19 in 2014 and 21 in 2015, in the Srinagar high court. The PILs have now involve the court to ‘interfere’ in every civil matter—deciding the school fees, illegal constructions, health, traffic, swine flu, drinking water facilities for pilgrims, etc. “It is happening because our administration is nowhere and people are left with only option that is knocking at the doors of court with PIL,” feels Saki, who even suggested J&K governor once to strike ‘some discipline’ in government employees for ‘prospering’ state administration. Now, after striking some staggering changes with PIL, Saqi says the concept is still new in Kashmir. But everyone can make use of it to strike a desired change in the society, he says. Perhaps, that is the reason why PIL is becoming popular in valley.